Even though summer is coming to a close, my garden is still spouting off produce like crazy. Over the past month, our tomato plants have been so prolific I can barely keep up. I've been sharing tomatoes with neighbors and co-workers, but it seems once I unload one batch, twenty more pop up on the plants. Last week, I picked another huge bounty of tomatoes, along with quite a few cucumbers, green peppers and jalapenos. I had more produce than I knew what to do with, so what happens when you're up to your gills in veggies? Make salsa! Usually when I make salsa I just hand-dice everything and then get really annoyed and impatient and never feel like the finished product was worth all that chopping. But this time around, my friends, I was equipped with a new kitchen gadget that I'm fairly certain will be my new BFF in the kitchen. 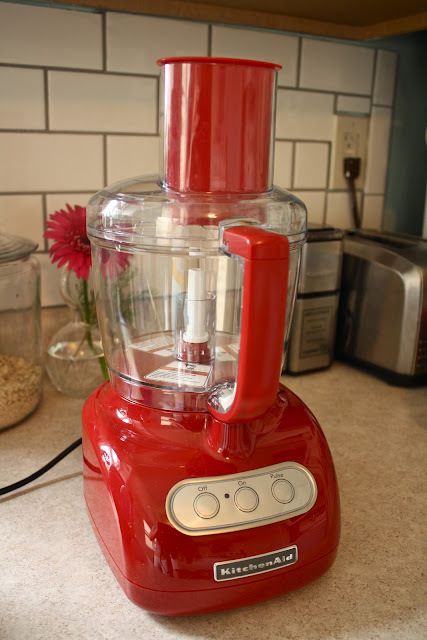 When I was in Ohio last week, my mom sent me back with this beat: a KitchenAid 7-cup food processor. Apparently she had bought this for me as a Christmas gift last year, but forgot to wrap it! It's been sitting in the basement ever since. Oh boy! Late/Early Christmas! I couldn't wait to put the thing to use, so on Saturday I figured making a finely-chopped salsa would be the perfect christening of the machine. I started off quartering a large pile of tomatoes from the garden... probably around 10. Then added them and the rest of the ingredients to the food processor: red onion, garlic, cilantro, cucumbers (I needed to get rid of some from our garden, too), jalapenos, green peppers, red peppers, cilantro, green chili pepper, lime juice and salt. I was pretty excited because so many of the ingredients were picked right in our backyard! Tomatoes, green peppers, jalapenos and cilantro. I turned on the food processor and was, frankly, startled by its power. I let the thing whirl for only about 6-8 seconds and it absolutely pulverized all the ingredients I'd shoved in there. The result was a very, very fine salsa. Next time I think I can get away with just pulsing three or four times. After the food processor finely chopped everything up, I wanted to add a little chunk factor, so I diced up three or four more little tomatoes by hand, chopped a little more onion, then added black beans and sweet corn. The result? Not the most beautiful salsa in the world, but it was certainly super fresh, super tasty and had the perfect amount of kick to it (thanks to the habanero). I just can't reiterate enough about how awesome it feels to eat something that was grown right out your door. Directions: If you've got a super-turbo-power food processor like mine, throw in all the ingredients (except the corn and black beans... add those in after the processing) and pulse 3-4 times. If you don't, simply chop and dice all the above ingredients in a bowl. Make sure you add the corn and beans after all the chopping, though! Do you have a go-to salsa recipe? This one is no frills, simply made to use up garden veggies, but I love any salsa with a twist!